Dont want to order on the Web? You can order from us via mail or by phone. These orders are usually shipped within 2-5 business days of receipt. 124 Spider Web Farm Rd. Pick out your own web when you visit the home of The Original Web Site. 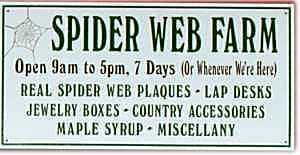 Knight's Spider Web Farm and Gift Shop. Open 7 days a week, 10 AM to 6 PM, June 15th through Oct. 15th. Then every weekend through Christmas, 11 AM to 4 PM or by appointment.